BLOOM: Tell us about your work in the Bloorview Research Institute? Masha Koroleva: I worked on a number of research projects with scientist Amy McPherson and postdoctoral fellow Ian Patton. The main project was looking at child disability and obesity and developing something called the Healthy Body Scorecard. It aims to be a holistic, comprehensive, but easy to use health-screening tool that looks at healthy lifestyle factors and behaviours in children with and without disabilities. BLOOM: Why is this tool needed? Masha Koroleva: The trend in health screening is to rely on body mass index, which is a ratio of height to weight. But that isn’t a very holistic way of understanding what could be contributing to someone’s weight and health issues. It’s more important to look at behaviours, lifestyle, environmental factors and to understand that someone’s health is a constellation of different contributing factors. BLOOM: What did your work involve? Masha Koroleva: I analyzed a subsection of a survey targeted to doctors, nurses and dietitians across the country. 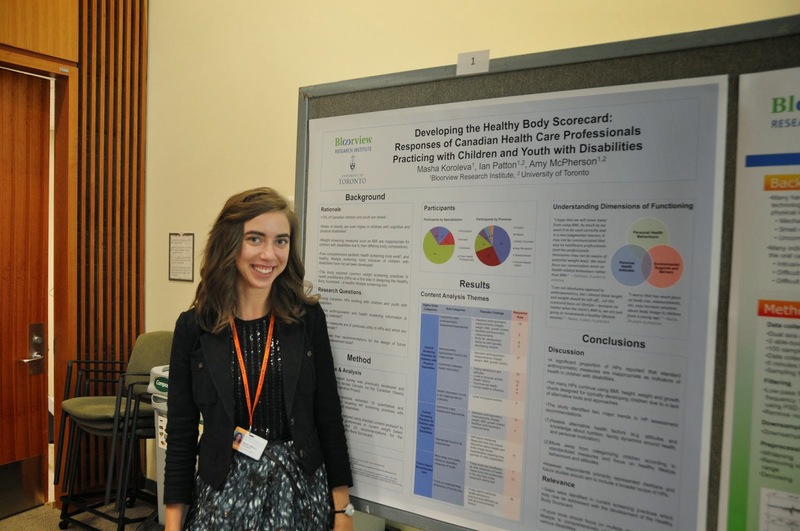 We wanted to understand what professionals are using as health screening practices for children with disabilities, what are the gaps, and if we were to develop the Healthy Body Scorecard, what would these professionals like to see in it. BLOOM: What did you find? Masha Koroleva: It confirmed that doctors, nurses and dietitians are primarily relying on body mass index as a health screening tool. But we know there are problems with using it as a sole indicator of health because a lot of kids with disabilities have very different body compositions. They can’t be compared to typical growth charts. The survey participants recognized these measures were inappropriate, but they didn’t have anything else that was easy to use. BLOOM: What did the doctors want in a new score card? Masha Koroleva: They were interested in three domains: child health behaviours and child health attitudes—not just what do you do, but how do kids think about health and what they know about healthy eating—and family lifestyle. 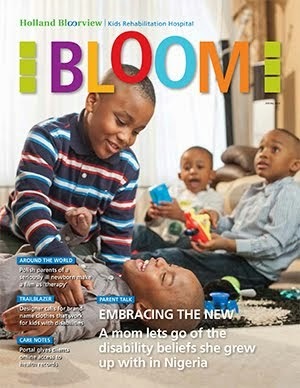 BLOOM: Why is weight a particular issue for children with disabilities? Masha Koroleva: Children with disabilities are less likely to participate in sports, more likely to have a sedentary lifestyle and more likely to eat high-calorie food. Sometimes there are also genetic factors. BLOOM: What was it like working as a research student here? Masha Koroleva: It was extremely exciting. Disability is something I’m very interested in. I’m very interested in people’s illness experiences and the idea of resilience and how people find themselves in very challenging circumstances and the ways they come up with to adapt to them. I got a chance to work with some inpatients interviewing them about health-related programs like Busy Bodies. I got to write a paper on understanding current health practitioner screening practices based on our survey. At the Ward Family Day I talked about my research, made a poster, and gave a presentation. There were a slew of lunch-and-learns that exposed me to different disciplines and to learning about different types of disability. That was eye-opening in understanding the uniqueness of every person’s challenge, and how for granted we take our own abilities. BLOOM: What did you get from your work with children? Masha Koroleva: Small, little interactions I had showed me the incredible power and resilience of people and the ability of every child to surprise you. It wasn’t necessarily this big heroic thing, but you’d see these little resiliences. I asked a boy in the spina bifida clinic what he was doing for the summer and even though it seemed that physically he would face a lot of challenges, he said he was taking a course in history and editing his own movies and soundtracks. I saw resilience in very simple, everyday actions. BLOOM: What did you learn from parents? Masha Koroleva: One of the interesting things parents said about Busy Bodies—which is a program focused on teaching kids about healthy lifestyles and nutrition and getting out to play sports and do new activities—is they all wished the program went on all summer, not just for one week of camp. They felt their children could only learn about healthy lifestyles if it became a given, something that was part of their routine everyday over time. They wished these programs were more available. BLOOM: What was it like working at Holland Bloorview? Masha Koroleva: I don’t think there’s any place like Bloorview that would have given me such a broad scope of what is possible and what exists. Everyone here seems so highly motivated and there’s a lot of love and community. It was great to be able to tap into that. Also, just the way the physical space of the building is designed is very conducive to how it functions. The first thing you notice is the physical structure and that sets the tone for how the internal aspects of Bloorview work: the amount of light, how well thought-out and accessible the spaces are, the proportions of the rooms and the details of the space with so much green around us. I think that’s good for the soul and it helps the mind function.